Orkney, an archipelago in Scotland, has a cool and temperate climate. The islands are far north but have a surprisingly warm climate due to the Gulf Stream. However, don't fantasize about beach going and sunbathing mild and wild co-exist here and that wild weather is part of the archipelago's charm. Orkney is one of the windiest places in the United Kingdom with gale force winds recorded in low-lying areas at least 30 days per year. It also experiences extreme variations in daylight and darkness throughout the year. In December, sunset can be as early as 3:15 p.m. with less than six and a half hours of total daylight. In June, around the time of the solstice, there can be nearly 19 of daylight, so you can go for your morning run, in daylight, before 4 a.m. and be reading a book, outdoors after the 10:30 p.m. sunset. April through June are ideal months to visit with longer days, warmer temperatures, and plenty of activities and festivals celebrating folk music, dance, and more. Winter is the windiest and the wettest time of year but there is very little snow. In fact, never gets brutally cold. Average winter temperatures hover around 41 degrees Fahrenheit (5 degrees Celsius). Early dusk in winter makes visiting some the island sights very dramatic, as it's mostly dark by the early afternoon. January is the windiest month, with winds of greater than 15 miles per hour occurring throughout the month. What to pack: While it never gets very cold on paper in Orkney, the combination of high winds and a damp environment can seem bone-chilling. Dress appropriately for winter weather by packing heavy, knit sweaters, a waterproof (and windproof) outer layer, and sturdy water-repellent shoes. Orkney begins to wake up in the spring, as temperatures rise slightly and the risk of rain decreases. May is one of the driest months and is also a popular month for birdwatching, as migratory cliff-dwelling birds take up residence on the isles. What to pack: Spring is warmer in Orkney, but the variable climate means you can experience all four seasons in one day. Pack accordingly, with lots of layers; a long-sleeved base layer, a sweater, and a wind-resistant outer shell, paired with jeans and boots, will work for most spring days. In summer, average temperatures are usually between 59 and 61 degrees Fahrenheit (15 and 16 degrees Celsius). 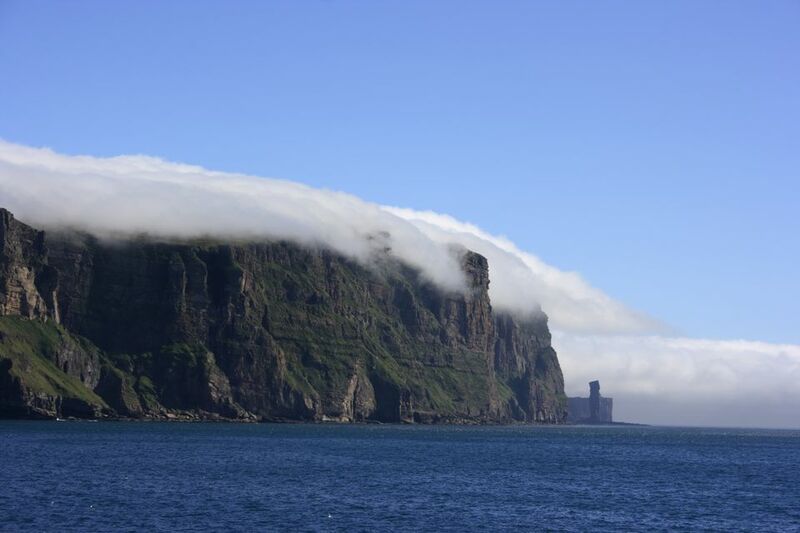 Cold sea fog and mist, known locally as sea haar, is common in the summer with some parts of the island experiencing more than others. With water temperatures reaching just 55 degrees Fahrenheit (13 degrees Celsius) even in the summer, ordinary swimming is not on the cards. But surfers and divers wearing wetsuits do find the summer water temperatures manageable enough to tackle the shipwreck dive sites in Scapa Flow. What to pack: Orkney's summer weather is still cool and breezy and luckily, mostly dry. Pack clothing that can be layered and bring long sleeves, pants, and sweaters. Midges (bugs similar to mosquitoes) are common throughout Scotland in the summer months, so bring insect repellant. Temperatures drop during autumn and rainfall increases—October and November are two of the wettest months—but this is prime time to visit if you're hoping for few tourists. It's also a great season to catch the Northern Lights, winter migratory birds, and the thousands of baby seal pups that flock to the area. What to pack: Pack plenty of warm cotton sweaters or cardigans, a scarf, jeans, and boots or other comfortable shoes. Fall is quite rainy, so bring along an umbrella and a trench coat or other waterproof jacket.